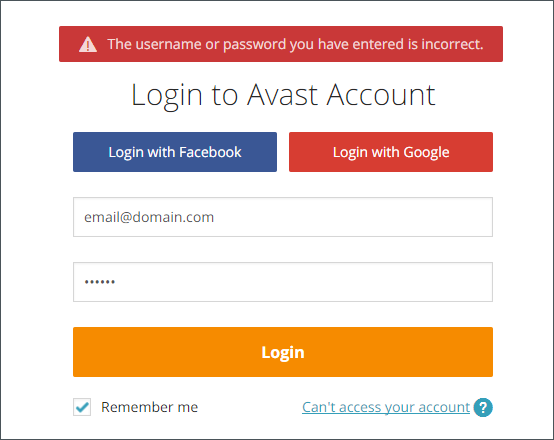 Entering an email address that is not registered: ensure that you are correctly entering an email address which is already registered as your Avast Account username. Entering an incorrect or old password: ensure the password you enter consists of at least 7 characters. Check if Caps Lock is turned on. If you are still unable to log in, you can try to reset the password for the account by following the instructions in the article below. By doing so, you can also find out if the email is registered in the Avast Account database, and if not, you can create a new account. The usual cause of this error is that service is temporarily unavailable due to maintenance. Please wait a few minutes and try again. If the same message is displayed after several attempts, you may contact Avast Support to alert them of the problem and ask for help. We do our best to make the service available at all times, but occasionally problems can arise.